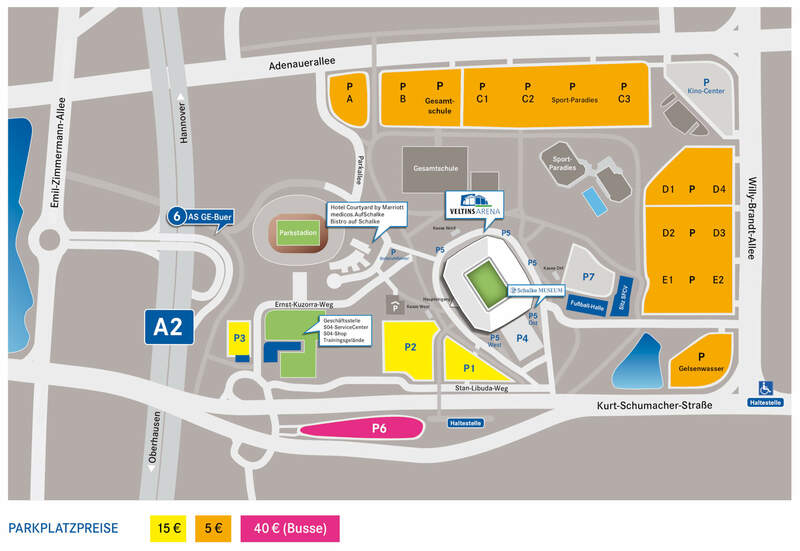 Public transport users can take the tram line 302 for club area, which runs from Bochum Main Station via Gelsenkirchen Hbf towards GE-Buer the stop „VELTINS Arena“. In all big events special cars are used by the Bogestra sufficient. The use of all VRR transport center list in the admission price. A detailed online timetable information can be found according to the website of VRR. Motorists leave the A2 at the exit Gelsenkirchen-Buer and keep after the arrival reproduced below sketch. In the Biathlon World Team Challenge, the special parking P1, P2 and P3 only accessed with a special parking permit. For parking of other visitors marked with „P“ areas at the Adenauerallee and Willy-Brandt-Allee are available. In passengers with reduced mobility should already alight at „Willy-Brandt-Allee“, as this stop is stair-free and only slightly farther away from the Arena. Copyright © 2019 | FC Gelsenkirchen-Schalke 04 e.V.